As Duke fans will remember from three weeks ago, the joy of winning a rivalry game is much sweeter when the game is away. On top of the extra satisfaction of overcoming the opponent’s home court advantage, the best part about rivalry road wins are getting to see the priceless expressions of disbelief and disgust on the faces of your enemies. Few fans will ever know what that experience feels like in person, but for one group of UNC students, the dream came true in March 2006. It was, in my estimation, the greatest possible fan experience ever achieved: an unexpected victory on Duke’s senior night, surrounded by 9000 miserable and embarrassed fans. At that point in the season, Duke had only been ranked only #1 or #2, losing just two games at Georgetown and Florida State. It was almost a storybook season that featured Shelden Williams recording Duke’s first triple double, a much-hyped five man freshmen class, Sean Dockery’s 40-foot buzzer beater against Virginia Tech, and classic lights out 40 point performances from JJ Redick against Texas and Virginia. A month earlier, Duke had beaten UNC at the Smith Center behind 35 points from Redick and a sweet reverse alley-oop from Dockery to McRoberts. On top of all that, it was senior night for fan favorites Dockery and Lee Melchionni (who kissed center-court during introductions), and Duke’s leading career rebounder and mayonnaise sandwich eater (Williams and Redick). The ACC Tournament is a waste of time. 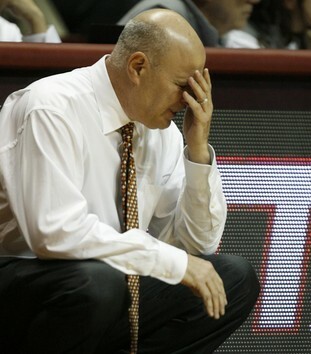 Va Tech fans know this Thinker pose well. Now, before you get all pissy: if you’re a Clemson or Florida State fan or, God help you, a Virginia fan, then the ACC Tournament is a valuable tool to enhance your seeding or your resume for the tournament. Actually, if you’re one of those fans, why are you reading this? And if you’re a Maryland fan, I’m still not over the fact that Greivis Vasquez played for you, so you get no love from me. The general gist of the anti-tournament argument goes something like this: for the conference royalty, UNC and Duke, seeding for the NCAA tournament is usually pretty set by the time the tournament comes around. The tournament thus serves merely a fatigue machine serving up two, maybe three more games for your star players to risk injury. At the very best, it’s forty to 120 more minutes of wear on already-beaten bodies. Well, s—. That wasn’t fun. The pain from a loss like Saturday’s is completely different than from a buzzer-beater loss–not better or worse, just different. A buzzer-beater loss is vivid, exciting, and intense–you can look back to one or two plays and question the team’s strategy: “Why did Andre Dawkins help off of Michael Snaer? Why didn’t Tyler Zeller put his arms up and prevent a 3-pointer?” It’s a brutal, heart-breaking way to lose, but you have that belief in your team right until the final buzzer. The margin between winning and losing is so thin that it’s–literally–awesome, and the final result will, in some way or another, shock you. But losses like Saturday? There’s no excitement, no sweaty palms, no nail-biting. No joy or belief that your team just needs one play right here to pull out a win. No crushing disappointment at the final buzzer, just gratitude that there’s no coda to drag out your pain further. Losses like that are just pure sadness and anger, wrapped in a bundle of unmet expectations and topped with a bow of rising frustration. In today’s episode, Ben and I wrap up Duke-UNC II, preview the ACC tournament, speculate about Kendall Marshall’s dad, and discuss the creepiness of the recruiting cults. Also, a classic lightning round, and I give out my cell phone number at the very end. Time stamps below. Don’t forget that you can subscribe to the podcast in iTunes. Just click “view in iTunes” once you reach that link, and then ‘subscribe for free.’ Voila. If you’re feeling really generous and benevolent, you could also rate the podcast and write a positive review. Before we get down to business, don’t forget that you can subscribe to the podcast in iTunes. Just click “view in iTunes” once you reach that link, and then ‘subscribe for free.’ Voila. If you’re feeling really generous and benevolent, you could also rate the podcast and write a positive review. In today’s special Duke-UNC preview edition, Ben and I talk about the big game, investigate the ins and outs of Duke’s credentialing process, get to the bottom of referee bias, untangle the Duke-UNC hype conspiracy, fret about the looming ACC basketball boycott bathe in the wisdom of Bleacher Report, do something called a “lightning round,” and field questions from our listeners and twitter followers. It is an exciting day, my friends. Enjoy the game. I had one specific thought that kept coming up in my head while watching the Duke-Virginia Tech game. It wasn’t that I loved watching this team play as my last post stated. It wasn’t that I was extremely disappointed in this team for letting an inferior opponent come into Cameron and nearly win. I kept thinking to myself that I wasn’t that surprised with how this game was going. This Duke team has reached a level I have literally (Rob Lowe reference) never seen before. I expected the 1999 Duke team to make the Final Four and would have been shocked if they would have lost in one of the first few rounds. I expected the 2007 Duke team to lose early in the tournament, and would have been surprised if they made it even as far as the Elite 8. This Duke team on the other hand could pretty much do anything, and I wouldn’t be surprised. I doubt they will lose in the 1st round, but beyond that anything is else is possible. Lose in the 2nd round to a team like Uconn? I could easily see that. Make it to the Final Four? I can see that happening as well. Has any other Duke team had a greater difference between their ceiling (defeating Kansas, Michigan, UNC, Michigan State) and their floor (NC State, Miami of Florida, Virginia Tech games)? Happy Monday, TRB readers. The last time that you heard from me, my perspective was heavy on the alcohol consumption and light on the optimism. You may have feared for me due to my curious silence after the loss to Miami. Perhaps that brutal home defeat had finally been enough to send me over the edge. While you may have pictured me slumped over a bottle of Buffalo Trace, sobbing into my favorite Battier jersey, the truth is much more mundane and shamefully adult. On that particular day, I was finalizing a move to Chicago for a new job, and didn’t have time to think about the game. I don’t enjoy life’s occasional reminders that there are many things more important than sports. This Duke team, which had been the softest, most confused team in recent memory, took the pen out of my hands with two amazing comebacks against in-state rivals. Even so, I wanted to withhold judgment about this group until I saw how they handled one of the biggest games of the year in Tallahassee. We knew how tough this game was going to be because of Florida State’s defense, their emerging star in Michael Snaer, and a hostile home crowd. Leonard Hamilton’s team certainly knows the recipe to beat the Devils. A win would have made it 3 straight, which sounds unbelievable, but is absolutely true. As the title of this post suggests, I’m in a particularly pleasant mood this morning. Duke beat Florida State last night 74-66 and gained some sort of revenge for the earlier loss. They are now in position to go undefeated on the road in the ACC for the first time since the 1999/2000 team. It has been an up and down year, but at this point it is clear that Duke has beaten their expectations. For example at the beginning of the year resident Duke expert Shane Ryan wrote on Grantland.com that “If I had to guess Duke’s fate, I’d say 11-5 in the ACC, good for second place, an ACC tournament title (after Carolina tanks in the first round), and a Sweet 16 exit.” Mark Titus’s picked Duke as the ACC’s most overrated team in his preview. There have been times this year where those type of predictions looked prescient. I don’t know many Duke fans that were expecting much after the loss to Temple. At their worst this Duke team can be an unatheltic, poorly constructed (no point guard) team that relies too much on the 3. However, today isn’t a day to think about what Duke isn’t, but instead it is time to celebrate what they are. As of RIGHT NOW, you can subscribe to the podcast in iTunes. Just click “view in iTunes” once you reach that link, and then ‘subscribe for free.’ Voila. If you’re feeling really generous and benevolent, you could also rate the podcast and write a positive review. That kind of thing warms our hearts. You can also access our podcast RSS feed. I’m not sure exactly what an RSS feed does, but some people seem to use it. So there you go. In today’s episode. Ben and I discuss Duke’s upcoming game against Florida State, revisit Carolina’s win at N.C. State, reflect on which American states have betrayed us by not listening to previous episodes, turn to Bleacher Report for wisdom and solace, and challenge Debbie Yow to a debate. Thanks very much for listening, and enjoy.